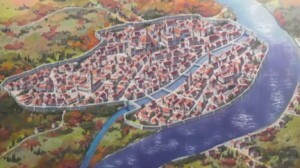 Kraft Lawrence is a 25 year-old traveling merchant who peddles various goods from town to town to make a living in a stylized historical setting with European influences. His main goal in life is to gather enough money to start his own shop, and he already has been traveling for seven years while gaining experience in the trade. One night when stopped at the town of Pasroe, he finds in his wagon a pagan wolf-deity girl named Holo (Horo in English) who is over six hundred years old. She appears to human as a fifteen-year-old girl, except for her wolf’s tail and ears. 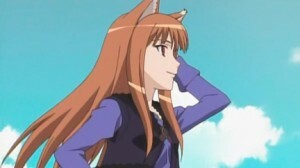 Holo introduces herself to Lawrence as the town’s goddess of harvest, who has kept the town’s fields blessed with good harvests of wheat for many years. Despite having the responsibility to watch over the town, she wants to go back to her homeland in the north called Yoitsu; she believes the people have already forsaken her and that she has kept her promise to maintain the good harvests. 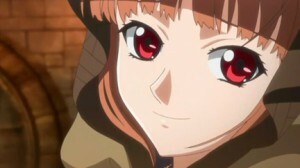 Holo also wants to see how the world has changed while she has remained in one place for years. 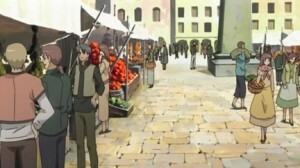 She manages to bargain her way out of the village by making a deal with Lawrence to take her with him. As they travel, her wisdom helps increase his profits, but at the same time, her true nature draws unwanted attention from the church. 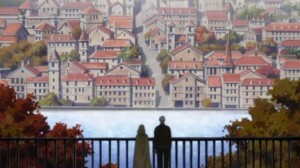 As Lawrence and Holo travel from town to town, the two slowly fall in love. 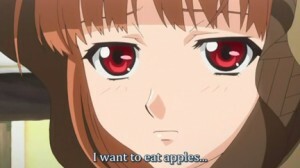 How I ever came to like Spice and Wolf is always a mystery to me because the series is just full of talking. 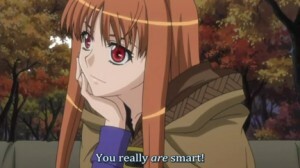 But though there are rarely any action scenes in Spice and Wolf, there is plenty of humor and romance. What Spice and Wolf is really about is teaching economics and business to the Japanese youth and the rest of the Japanese culture, which is why there is so much talking in the series. Spice and Wolf talks negotiation, business, economics, risks, love, not getting too greedy and corrupt, what is most important to an individual, value, etc. But all of this is not where I think the series shines the most. 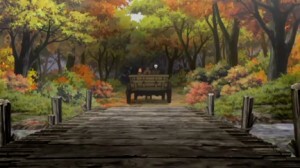 Where the series shines the most is in its humor and romance. Whenever Horo and Lawrence talk about romance and their love, Horo always teases Lawrence and always gets whatever she wants (mostly because she is a cute girl and a powerful wolf). But the series spices up a lot when Lawrence starts to learn how to counterattack Horo’s teasing though it’s a lot of talking. 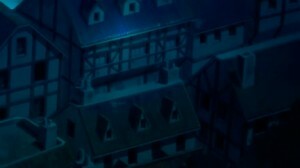 The romance is also a lot of talking, but is also where the action scenes are. Whenever Lawrence gets too deep into a business deal, Horo always pulls Lawrence out. 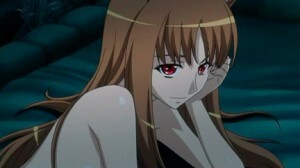 The romance comes more specifically after the action when Lawrence remembers what he values the most, Horo. 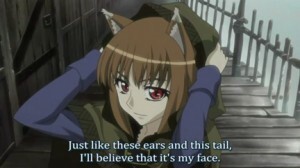 The romance moments in the Spice and Wolf also brings out the most important lessons in any kind of business, always remember what is the most important thing that a person values and to not get too deep into a business deal. These romance parts of Spice and Wolf is where everybody goes “Aaawwwww” because the love between Horo and Lawrence is really just sweet and cute. The romance parts are also where Horo and Lawrence both get embarrassed and blush.